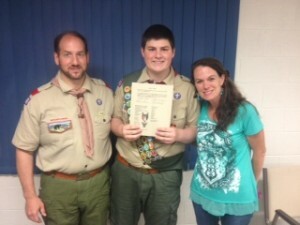 We are pleased to present Wesley Wells as Troop 7′s newest Eagle Scout. Please join me in congratulate him! This accomplishment is truly something to be proud of. Wow, congratulations Wesley! Zi and I are so happy for you! I know it was tough but you endured and reached the pinnacle of scouting. What a huge boost for your confidence which will accompany you wherever you go! Awesome!!! Congratulations Eagle Scout Wesley Wells! Job well done!
. . . and to you, Amy & Tom, as well! Click Me! Take off & fly now! let me join the others in congratulate you and your parents on such a great milestone. Congratulations, Wesley! That’s a big accomplishment! Congratulations Wesley! I am so happy for you! The rest of the Byrnes send their congratulations as well! This entry was posted in Eagle Scouts, Troop News and tagged Eagle, Scout, Wesley. Bookmark the permalink.